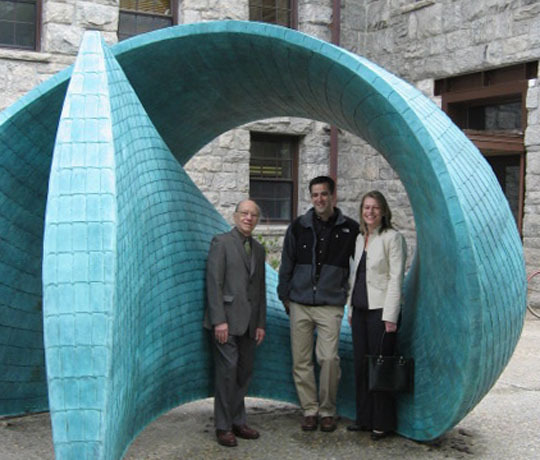 Peter Diepenbrock’s sculpture in front of the newly renovated Lippitt Hall at the University of Rhode Island was dedicated with a well-attended ceremony on April 26th. 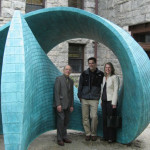 KITE’s renovations were completed in early 2009 and the sculpture was funded by RI’s public art program. Diepenbrock’s remarks at the event stressed how important the arts are for their ability to teach a process of establishing a vision, then setting goals and understanding one’s own capacity to reach them. As an example, he noted how the large bronze sculpture was built entirely by him and an assistant without special equipment: it is a 4,000 lb sculpture built 6 oz at a time. Thanks are owed to RI Citizens for the Arts and the RI General Assembly for ensuring that funding is available for public arts and acknowledging their importance in our society.